Calculators are excellent promotional products because they are used by everyone. Whether they’re a business professional, student or homemaker, they’ll need the help of a reliable calculator. 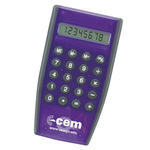 This translucent calculator is a colorful way to prominently display your company name, logo and slogan. Available in more attractive colors and styles.